Select IAPA articles on infrastructure FREE through 31 January! 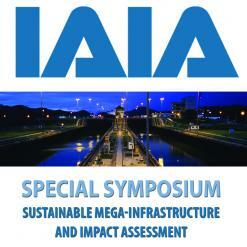 IAIA recently held a Special Symposium in Panama City, Panama, on Sustainable Mega-Infrastructure and Impact Assessment. To mark the event, Taylor & Francis is providing free access to the top five downloaded articles of 2015 from Impact Assessment and Project Appraisal, IAIA's quarterly professional journal. These papers are free and open to the public until 31 January 2016.